John C. Whitehead was born in Evanston, Illinois, in 1922 and died in New York in 2015. He graduated from Haverford College in 1943 and served in the U.S. Navy, during World War II. Mr. Whitehead received his M.B.A. degree from Harvard in 1947 and began at Goldman, Sachs & Co. 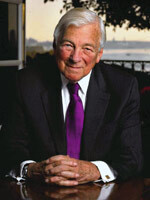 He became Partner in 1956, and Senior Partner in 1976. In 1985, Mr. Whitehead was asked by President Reagan to become Deputy Secretary of State. He was sworn into office in July 1985, and served until January 1989. He is the former Chairman of such diverse organizations as The Federal Reserve Bank of New York, The Harvard Board of Overseers, the International Rescue Committee, the United Nations Association, Haverford College, The Asia Society, the Hungarian-American Enterprise Fund. He is Chairman of the Boy Scouts of America/GNY. In late 2001, he was appointed as Chairman of the Lower Manhattan Development Corp, the organization responsible for the rebuilding and revitalization of Lower Manhattan. He served in that position until May 2006. He was also the Founding Chairman of the National September 11th Memorial and Museum at the World Trade Center. John C. Whitehead passed away in New York on 7 February 2015.